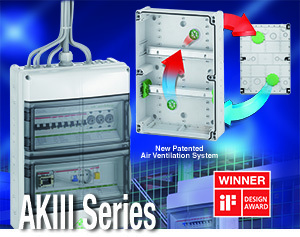 The patented Air Ventilation elements avoid condensate water while preserving the high protection class IP65. Occurring condensate is transported out of the enclosure immediately via air exchange. The continuous and high air exchange allows the interior air to mix constantly with the environmental air and transports the moisture outward. Even environments with nearly constant humidity and temperature possess air exchange, since the air on the interior of the enclosure warms due to the fittings. The individual components of the ventilation elements mainly consist of the rotating cover (rear side of box) and the 10µm filter element integrated on the inside of the box. Click here for 2 page flyer. Non-Contact Safety Sensors use RFID technology to generate a signal that determines if the sender and receiver are within range of each other—up to 13 mm. These devices are ideal for detecting if doors, gates, guards, or panels are properly closed, preventing access to dangerous areas of a machine or system. Sensors based on RFID technology provide a mechanical-free operation without wear and tear on the components. Keyed safety switches and reed switches, which are often used as safety switch devices, are mechanical in design. This highly increases the odds that the components will wear out or need routine maintenance to keep them operational. Non-contact sensors only required alignment within 13 mm and provide a warning if the actuator is beginning to travel out of range. Keyed switches require precise alignment to assure that the key is correctly inserted into the switch. Misalignment by more than a few mm’s—which can occur when a door sags—can cause the key to hit the side of the switch instead of the slotted entry point, causing damage to the switch or key. 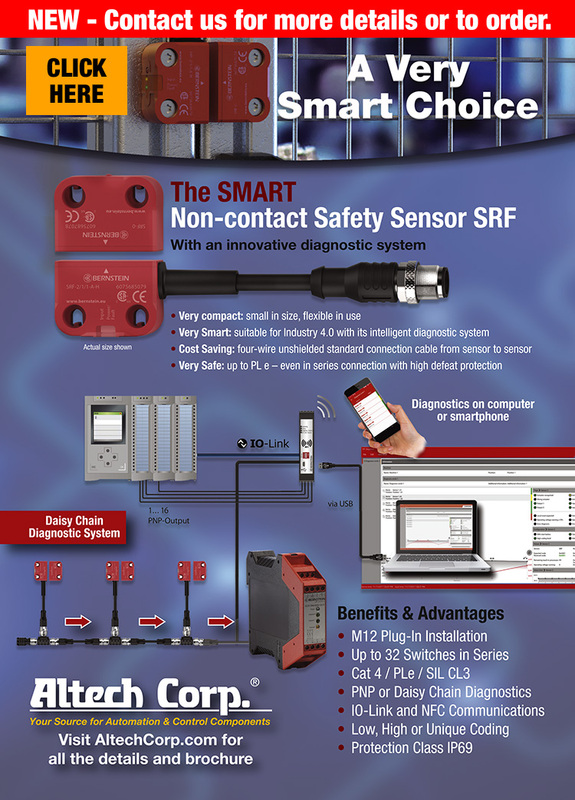 Solid-state components, such as Altech’s SRF (Safety RFID) sensor, can be installed quickly and simply. Both the sensor and actuator are easily mounted with two screws and require a minimum amount of alignment. Since they don’t have to be perfectly aligned, users have a wide tolerance in mounting positioning. Cables feature M12 connectors which offer plug-and-play installation convenience, eliminating wiring labor and errors. Ensures you can have multiple sensors in series. The M12 connector from the sensor, as mentioned above, can be plugged into a “T” connector, creating a common main line between sensors which feeds into a safety relay. The sensors and connectors have an IP69 protection rating and the main line uses a four-wire cable, which also reduces installation costs. Up to 32 sensors can be used in series, utilizing the plug-in connectors. More important than the technology you are using is ensuring that your operators are safe. Non-contact devices like the SRF sensor are rated PLe/Category4/SIL CL3 even when used in series via redundant OSSD outputs. The two OSSD safety outputs operate independently from the diagnostic outputs. This is similar to the outputs used with light curtains and other solid-state safety products. Remain wash-down ready at all times. With a protection rating of IP69 (Protection Class III) and simple device construction with limited nooks and crannies, non-contact safety switches are wash-down compatible for use in the food and beverage industry. Since the solid-state components operate without moving parts, they can be used in harsh environments where shock and vibration could damage mechanical switches. While mechanical switches might fail, non-contact switches can offer a service life rating of up to 20 years. Ensures you have adequate diagnostics. There are two different levels of diagnostics available with the SRF non-contact sensors: PNP diagnostics offer a PNP NO output that indicates whether the safety guard is opened or closed, while DCD (Daisy Chain Diagnostics) offers much more detailed information—providing more than 20 different types of diagnostic information via an internal bus system that can be accessed at the end of the series cable. This data can be accessed by the machine’s control system via I/O Link and/or displayed on an Android Smartphone or tablet using NFC (Near Field Communication) technology. Both levels of diagnostic systems operate independently of the safety outputs. The sensors are offered with three different coding levels. Low level coded sensors are activated with any SRF actuator. High level coded sensors are paired with one specific actuator. Unique level coded sensors can only be paired once. After pairing, the sensor cannot be activated with any other actuator. The pairing procedure does not require any additional equipment. 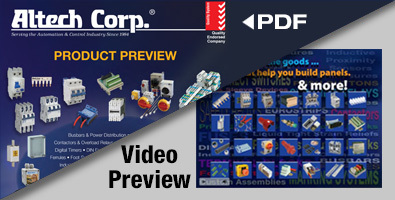 Select components that offer fault tolerant outputs. 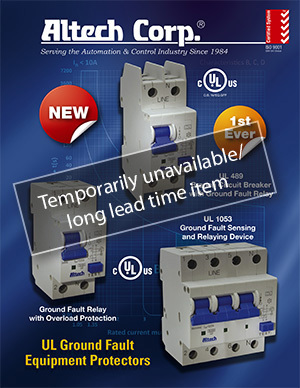 Fault tolerant outputs prevent unnecessary machine shutdowns. If both OSSD safety outputs are lost, caused by an unsafe condition (such as a door being opened), you want your machine to immediately shut down. However, if only one output is lost (caused by a fault in the sensor or wiring), your sensor should indicate the condition with a flashing code and transmit the information via a DCD system (if used). After a certain amount of time, the machine should be shut down. Click here for interactive panel. 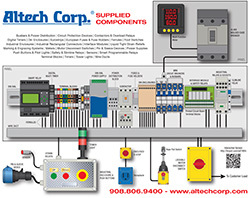 Altech Corporation is a Supplier and Distributor of Electronic and Control Components. 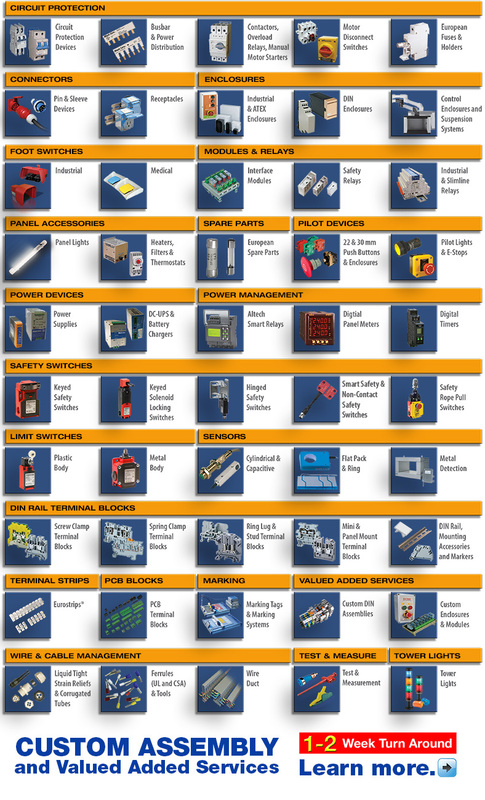 Our product line includes Terminal Blocks, Fuses, Circuit Breakers, Disconnect Switches, Inductive Proximity Sensors, Industrial Enclosures, DIN Enclosures, Interface Modules, Foot Switches, Liquid Tight Strain Reliefs, Safety Relays, European Fuses, PIN & Sleeve Devices, Power Supplies and Wire Ducts.